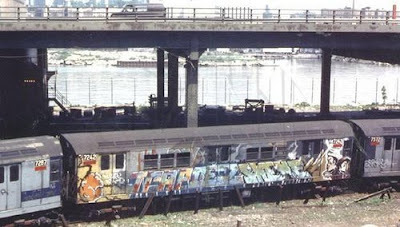 Here's some vintage paint on steel from NYC's transit system. 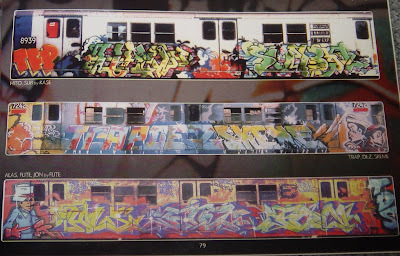 In particular it shows one of my favourite window-downs from Trap, Dez and Skeme and a dope "camouflaged" 3D burner by the mighty Kase. Simply click on the photos to enlarge. good stuff. where'd you cop them from? yo Fish ... these are from STYLE: WRITING FROM THE UNDERGROUND book.